Let’s investigate all the pros and cons of both solutions. Flexible hours – You can wake up as early as 5 a.m. and come home as late you you wish. Do you want to sleep in? No problem. Snooze the alarm for another 15 minutes and leave whenever you are ready. Your rental car will be waiting for you whenever. Flexible route – Want to stop by some temple on the way? No problem! The hired vehicle does not care where do you go. Comfort – Yes, You can listen to any music as loud as you want to and Yes, You do not have to stay next to someone you do not like. And lets not forget about the air conditioning you can control to the temperature you like. Boot space – You can still take all the Photo Camera Gear even if you are un-sure what lenses you would need to take the best pictures. Privacy – Speak any language, talk any secrets, play any games. Just do not forget to clean your hired vehicle before you return it. Parking – You do need to store your car somewhere safe over the night. Luckily most of the hotels offer the parking space. Planning on drinking at the destination? Yes, you should never drink and drive. Nevertheless, you might not be allowed drunk in the public transport either. Cheap – New Opal Card offers very good deals. For as little as 60 Australian Dollars a week you can travel around Sydney on buses, trains and ferries. Schedule – Rental car gives you the freedom to plan your own schedule where catching the public transport is almost like living someone’s time table. Public – If you are 100% extravert you might enjoy it. However most people prefer to travel in their own conform. Talk to their own kids only. Listen to their music. Talk the language they are comfortable with. Traffic – You will be surprised but the traffic jams is not a problem for the rentals cars, you are free to change your plans. In case of the public transport, you are limited in options. Most of the time you are locked into the waiting until you get to the final destination. This is your choice. Obviously, most of people consider renting a car as a better practice for travelling the world. Nevertheless they are still some people out where who prefer a few drinks over the comfort of the air conditioning. Before you decide, ask yourself what is your goal? Do you want to visit all those places in the company of the people you travel with while in a rented car, or are you after the adventure and meeting new people and leaving the cultural differences of slow Sydney trains but fun Sydney people? If you decide to rent a car, do not hesitate to contact one of our specialists. 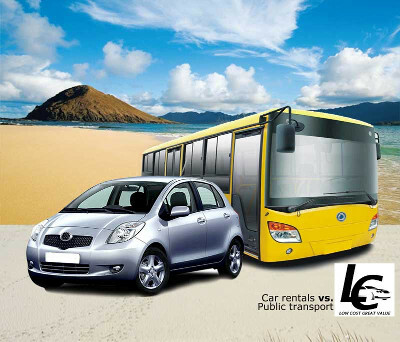 Low Cost Car Rentals is designed to make your trip successful and your experience memorable. Call our office or simply submit an enquiry on the site. Rent a car from people you trust. Regardless of your choice Circular Quay to Manly on the Ferry is the must, as well as the car drive down to Jarvis Bay – the famous drive on the Stanwell Bridge to the whitest sands in Australia. Tagged hire a car, hire a car sydney airport, public transport, rent a car, rent a car in sydney, rental vehicle.